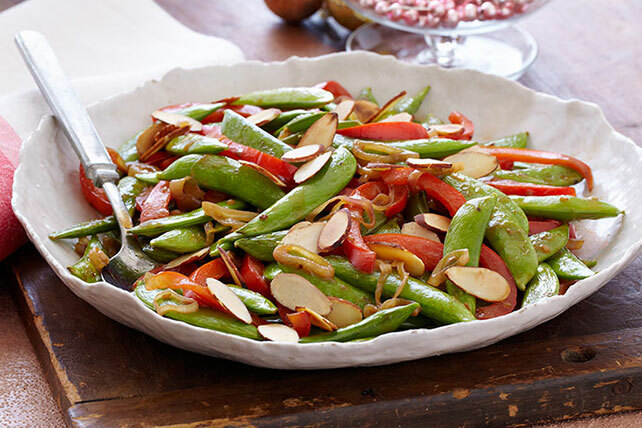 Serve a colorfully crisp dish in just 20 minutes with this Sugar Snap Peas Recipe. This better-for-you-Asian-inspired Sugar Snap Peas Recipe will go fast. Heat oil in large nonstick skillet on medium heat. Add vegetables; stir-fry 6 to 7 min. or until crisp-tender. Stir in dressing; cook 1 min. or until heated through. Add 1/4 tsp. crushed red pepper to cooked vegetables in skillet along with the dressing.